Ballaí don ghaoth agus díon don bháisteach, agus deochanna in aice na tine.Irish-Gaelic to English Translation:Walls for the wind, And a roof for the rain, And drinks beside the fire. Beannaigh tú féin agus do chuid, chomh maith leis an teach bheag a bhfuil tú i do chonaí. 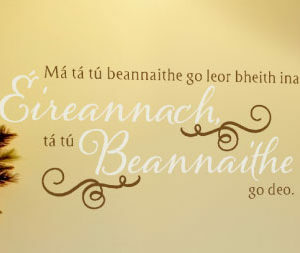 Go mbeadh tuí mhaith ar an díon os a cionn, agus iad sin taobh istigh go réiteódh siad lena chéile i gcónaí.Irish-Gaelic to English Translation:Bless you and yours As well as the cottage you live in. May the roof overhead be well thatched And those inside be well matched. Beannú Eireannach… Bia folláin agus deochanna urrúnta, piliúr glan i gcomhair do cheannsa, go gcaithfeá daichead bliana sna flaithis agus nach mbéadh a fhios ag an deamhain gur tú féin atá marbh.Irish-Gaelic to English Translation:Irish Blessing... Ample food and sturdy drink, A clean pillow for your head, And may you be forty years in heaven before the devil knows you're dead. Beannú Eireannach… Mar a théann tú síos céimeanna an tsaoil, nach sínfeadh na sceilpe an treo mícheart.Irish-Gaelic to English Translation:An Irish Blessing... As you slide down the bannisters of life, may the splinters never point the wrong way. 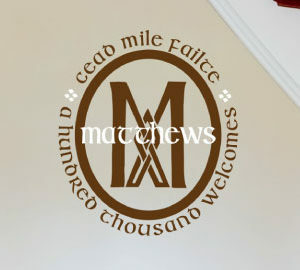 Céad Míle FáilteIrish-Gaelic to English Translation:One hundred thousand welcomes. Gaire chun tú a shásaimh agus siúd atá in aice leat atá grá agat dóibh. Agus iomlán atá de dhíth ó do chroíse.Irish-Gaelic to English Translation:Laughter to cheer you And those you love near you. And all that your heart may desire. Go bhfanfadh an díon ós ár cionn go socair, agus nach mbrisfeadh an cairdeas idir siúd a bhfuil bailithe faoi.Irish-Gaelic to English Translation:May the roof above us never fall in. And may the friends gathered below it never fall out. Go bhfásfadh an féar ar an mbóthar go h-Ifreann de bharr easpa úsáide.Irish-Gaelic to English Translation:May the grass grow long on the road to hell for want of use. Go bhfásfadh glúin pháistí ó ghlúin do chuid pháistíIrish-Gaelic to English Translation:May there be a generation of children On the children of your children. Go dtabharfadh Dia, Ré Solas greine chun tú a théamh, Ré ón ngealach chun tú a chur fé dhraíocht, Aingeal cosainte, chun tú a choimeád sábháilte.Irish-Gaelic to English Translation:May God grant you always...A sunbeam to warm you, A moonbeam to charm you, A sheltering angel, so nothing can harm you. 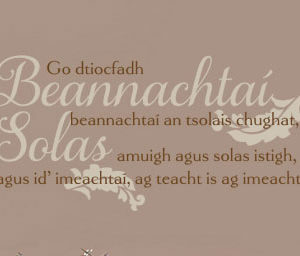 Go dtabharfadh gach phiotal ar an tseamróg dea-dhúil chughat, dea-sláinte, da bhuíochas agus sonas. I gcomhair inniu agus gach lá eile.Irish-Gaelic to English Translation:For each petal on the shamrock This brings a wish your way, Good health, good luck, and happiness For today and every day. Go dtabharfadh siúd a bhfuil grá agat dóibh grá ar ais chughat, agus go dtiocfadh na beannachtaí uilig atá ag teastáil uait beo!Irish-Gaelic to English Translation:May those you love bring love back to you And may all the wishes you wish come true! Go dtiocfadh beannachtaí an tsolais chughat, solas amuigh agus solas istigh, agus id' imeachtaí, ag teacht is ag imeacht.Irish-Gaelic to English Translation:May the blessings of light be upon you, Light without and light within. And in all your comings and goings. Go líonfadh fuaimeanna an cheoil áthasch agus an gáire ceolmhar Éireannach do chroíse le sonas, a bhfanfadh go deo ina dhiaidh.Irish-Gaelic to English Translation:May the sound of happy music And the lilt of Irish laughter Fill your heart with gladness That stays forever after. Go loinnródh an ghrian ar feadh an lae, Go mbeadh gach rud i gceart agus nach rachadh aon rud mícheart.Irish-Gaelic to English Translation:May the sun shine all day long, Everything go right and nothing go wrong. Go lonródh an solas ort ar lá dorcha. Nuair is ghá duit bheith sa bhaile, go shiúlfá an slí. Go mbéadh an crogacht ionat seans a thogáil, agus gan froganna a fháil id' bhríste.Irish-Gaelic to English Translation:May the light always find you on a dreary day. When you need to be home, may you find your way. May you always have courage to take a chance, and never find frogs in your underpants. Go mbainfeadh deannach rothanna do vaigínse radharc na súl do chuid naimhde.Irish-Gaelic to English Translation:May the dust from your wagon wheels blind the eyes of your enemies. 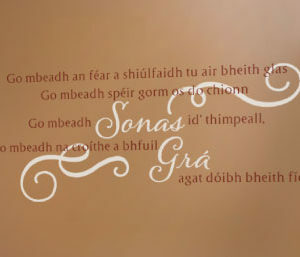 Go mbeadh an féar a shiúlfaidh tu air bheith glas, go mbeadh spéir gorm os do chionn, go mbeadh sonas id' thimpeall, go mbeadh na croíthe a bhfuil grá agat dóibh bheith fíor.Irish-Gaelic to English Translation:May green be the grass you walk on, May blue be the skies above you, May pure be the joys that surround you, May true be the hearts that love you. Go mbéadh do chuid bheannaithe nios líonmhaire ná an méid seamróga a bhfásann, agus nach dtiocfadh trioblóid leat aon áit dá racadhsa.Irish-Gaelic to English Translation:May your blessings outnumber the shamrocks that grow, And may trouble avoid you wherever you go. Go mbeadh do chuid trioblóidí níos lú, agus do chuid beannachtaí níos mó. Agus nach dtiocfadh aon rud ach gliondar isteach id' dhoras.Irish-Gaelic to English Translation:May your troubles be less And your blessings be more. And nothing but happiness Come through our door. Go mbéadh do lá lán de bheannachtaí coúil leis an ghrian a lonraíonn an spear, agus go mbeadh an críonnacht ionat do sciatháin a shíneadh agus eitilt!Irish-Gaelic to English Translation:May your day be filled with blessings Like the sun that lights the sky, And may you always have the courage To spread your wings and fly! Go mbeadh do lámh dheas sínte amach le cairdeas i gconaí agus gan aon ní de dhíth air. Mar a eiríonn an ghrian óir os cionn Éire, go dtabharfadh gal te na gcoirce teas id' gáire dea-oibreach.Irish-Gaelic to English Translation:May your right hand always Be stretched out in friendship And never in want. As the sun rises gold Over the Emerald Isle, May your oat's hot steam Warm your hard work smile. Go mbeadh focail deasa agat ar thráthnóna fuar, ghealach geal ar oíche dorcha, agus bother síos an chnoc go do theachsa.Irish-Gaelic to English Translation:May you have warm words on a cold evening, A full moon on a dark night, And the road downhill all the way to your door. Go mbéadh suíochan leat gan caoineadh. Go líonfadh an grá na saolta a bhogaimid gan stopadh. Agus go líonfadh ár ngrá an domhain, sciatháin na n-aingil ag cleitearnaí go séimh.Irish-Gaelic to English Translation:May we live in peace without weeping. May our joy outline the lives we touch without ceasing. And may our love fill the world, angel wings tenderly beating. Go múchadh an bháisteach fuar tar do chuid bláthanna, athuadh do spiorad, agus go nglanfadh sé as do chuid trioblóidí.Irish-Gaelic to English Translation:May the cool rain quench your flowers' thirst, Renew your spirit, And wash your troubles away. Go n-éirí an bóthar leatIrish-Gaelic to English Translation:May the Journey you are making be a safe one. 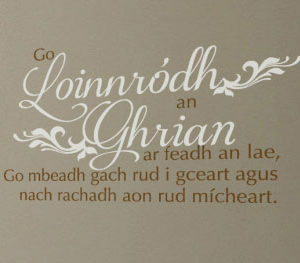 Go n-oibreódh tú gan airgead de dhíth ort, go ngráfaidh tú gan aon fulaingt, agus go ndámhsódh tú gan aon duine ag féachaint ort.Irish-Gaelic to English Translation:May you work like you don't need the money, Love like you've never been hurt, and Dance like no one is watching. Go nglacfadh na srutháin, na crainn agus na cnoic ceolmhara páirt sa curfá, freisin. Agus go gcuirfeadh gach gaoth séimh a séideann sonas cughat féin.Irish-Gaelic to English Translation:May brooks and trees and singing hills Join in the chorus, too. And every gentle wind that blows Send happiness to you. Go siúlfaidh tú ar solas na gréine i gcónaí, nach mbeadh aon rud eile de dhíth ort, go leagfadh na h-aingil Éireannacha a cuid sciatháin in aice do dhoras.Irish-Gaelic to English Translation:May you always walk in sunshine. May you never want for more. May Irish angels rest their wings right beside your door. Is glas iad na cnoic i bhfad uainnIrish-Gaelic to English Translation:The fields are greener far away. Is minic a bhris béal duine a shrónIrish-Gaelic to English Translation:Many a time someone's mouth broke their own nose. Má tá an t-ádh leat bheith ina Éireannach, tá an t-ádh leat go deo.Irish-Gaelic to English Translation:If you're lucky enough to be Irish then you're lucky enough. Má tá tú beannaithe go leor bheith ina Éireannach, tá tú beannaithe go deo.Irish-Gaelic to English Translation:If you're blessed enough to be Irish then you're blessed enough. Mar a théann tú síos céimeanna an tsaoil, nach sínfeadh na sceilpe an treo mícheart.Irish-Gaelic to English Translation:As you slide down the bannisters of life, may the splinters never point the wrong way. Nach mbuailfeadh naimhde na h-Éireann le aon chara riamh.Irish-Gaelic to English Translation:May the enemies of Ireland never meet a friend. Nuair atá gáire le feiceáil i súile Éireannacha, tá rud éigin ag tárlú de gnáth.Irish-Gaelic to English Translation:When Irish eyes are smiling, they're usually up to something. Oideas Sean-Éireannach i gcomhair saol fada: fág an tábla ocrach. Fág an leaba tuirseach. Fág an tábla tartmhar.Irish-Gaelic to English Translation:An Old Irish recipe for Longevity: Leave the table hungry. Leave the bed sleepy. Leave the table thirsty. Seo chuig grá-geal, buidéal, agus chara. An chéad ceann go h-álainn, an dara ceann lán, agus an ceann deireanach dílis i gcónaí.Irish-Gaelic to English Translation:Here's to a sweetheart, a bottle, and a friend. The first beautiful, the second full, the last ever faithful. Siúlfaidh alán daoine isteach agus amach ó do shaol, ach ní fhágfaidh ach cúpla daoine coiscéimeanna id' chroí.Irish-Gaelic to English Translation:Many people will walk in and out or your life, but only true friends will leave footprints in your heart. Tá dea longanna, tá longanna adhmaide, ná longanna a sheolanna sna h-aigéanacha.Is longanna iad na cairdeas is fearr, Agus go mbeidh siad i gcónaí.Irish-Gaelic to English Translation:There are good ships, and there are wood ships, The ships that sail the sea. But the best ships are friendships, And may they always be. Tá gáire mhaith agus codladh fada na dhá leigheasanna is fearr.Irish-Gaelic to English Translation:A good laugh and a long sleep are the two best cures. 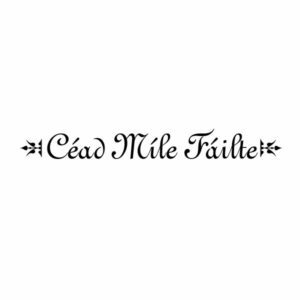 Tús maith, leath na h-oibreIrish-Gaelic to English Translation:Good start, half the workload. Ualach beannachtaí agat féin, Dia agus a h-aingil in aice láimhe, Cairde agus Clann, go dteaspáfadh a ghrá, Agus beannachtaí Eireannacha i do chroí!Irish-Gaelic to English Translation:A world of wishes at your command, God and his angels close at hand, Friends and family, their love impart, And Irish blessings in your heart! Go mbeadh ár dteachsa ró bheag chun ár gcáirde go léir a choimeád.Irish-Gaelic to English Translation:May our home always be too small to hold all our friends. Éireann, is é an t-aon áit amháin ar domhan a thug an flaitis séis, gliondar, Agus cluain agus Ceo.Irish-Gaelic to English Translation:Ireland, it's the one place on earth That heaven has kissed With melody, mirth, And meadow and mist. Go lonródh an ghrian ort ar feadh i bhfad, grá id thimpeall, agus go dtugadh an solas laistigh dui tar do threoir thú.Irish-Gaelic to English Translation:May the longtime sun shine upon you, all love surround you, And the sweet light within you guide you on your way. Níl aon tinteán mar do thinteán féinIrish-Gaelic to English Translation:There's no place like home. Tá an saol cosúil le cupán tae, tá sé ag braith air conas a dhéanfá é.Irish-Gaelic to English Translation:Life is like a cup of tea, it's all in how you make it.